Established in 1978, Heart Industries Ltd. has been strictly and successfully focused on the creation and marketing of "Made in Canada." Both the "Heart Industries" and "Canada True" brands are well established within the Canadian tourist attractions, gourmet and specialty markets. We pride ourselves on the creation of unique packaging, recipes and product design. Our products are held to the highest quality standards and are truly representative of all our country has to offer. Specialty foods: Include a full selection of chocolate truffles, cookies, candies, confectionery, teas and nougat. 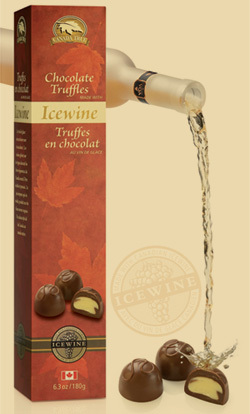 All of our unique recipes include pure Canadian Maple Syrup or pure Canadian Ice-wine. Our gourmet specialty foods are all created using the finest ingredients and are elegantly packaged in a variety of formats all depicting "Canada". Hard Goods: "Canadian Made" glassware, key-chains, magnets, pens, and collectibles including silver-plated and pewter spoons and thimbles and Amethyst figurines. All of our specialty hard-goods are manufactured using quality materials and offer dynamic design and make-up depicting "Canadiana". Thank you for visiting our site and for your consideration of our uniquely Canadian products. Contact us for more information.